Pros: Casting director Mark Pettitt deserves an award, because the collective vocals of the Godspell cast were the best I have ever heard in the West End (I’m under 30 but that still says something). Cons: The speaker distortion reduced the sound quality, and as a result I couldn’t always hear the lyrics. A great evening filled with sing-along songs and vocal miracles! 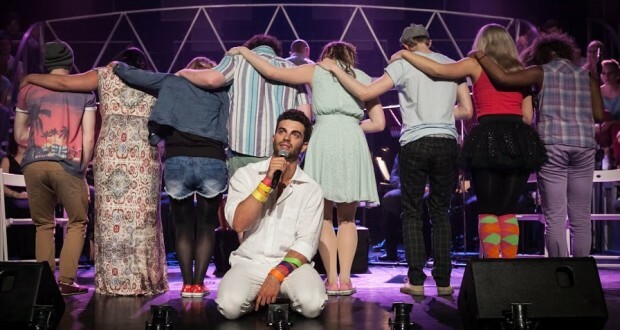 Let’s send out the call to bring Godspell back to the West End! Introduced by David Essex, who took on the lead role in Godspell in 1971, this night was very much a celebration of the musical’s history, which stretches back forty years. I felt so grateful sitting in the dress circle, which was buzzing with the anticipation of people who clearly knew the music, and were thrilled to be hearing it again. 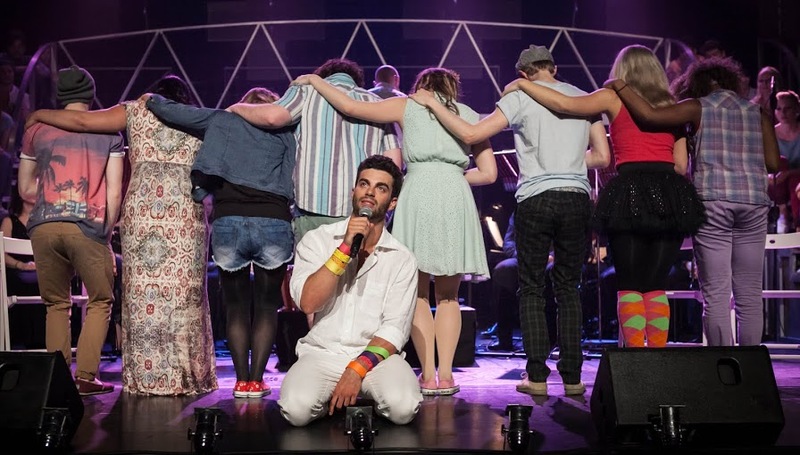 Though it’s been revived on Broadway since its inception, it took the passion and commitment of producer Russell Scott and his supporters to bring Godspell back to London for this very special evening. Approaching the Lyric Theatre on my arrival I was confused by all the Thriller posters, but once inside the unmistakeable imagery of the snazzy programmes calmed my racing thoughts – “Oh my god should I be in Hammersmith? Am I at the wrong Lyric?” I wasn’t, and the Lyric on Shaftsbury Avenue was the perfect venue: comfortably squashed next to the Apollo at the heart of the West End, the theatre was warm and inviting. More importantly, there were more than two cubicles in the ladies toilets. Godspell takes its narrative from the Gospel of Matthew. The show is written in a way that doesn’t make it feel preachy or dogmatic, which I personally really appreciated . Though it uses a religious text as its plot, the musical can be enjoyed by anyone who appreciates a good story, irrespective of their personal theology. The scenes all had a fun, improvised feel about them, which lent itself well to representing the lessons that Jesus teaches his followers through storytelling. The continual movement and change was also really exciting visually. 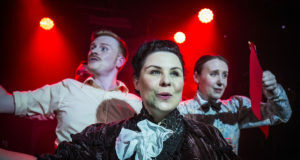 The cast are superb, funny and chameleon-like, switching from one identity to the next as they ‘improvised’ the Gospel tales, using their bodies and voices to mime, dance and tell to great effect what could not be shown literally on the relatively bare stage. 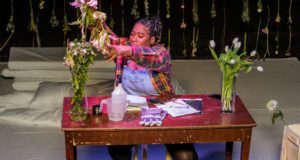 The simplicity of the staging is well suited to the improvisatory nature of the scenes, and, most importantly, doesn’t distract from the voices of the cast. And what voices! If I started naming names this review would be more like a register, but I will say that my jaw dropped in awe at pretty much every song. If the response from the audience was anything to go by I wasn’t the only one who was blown away either! The only minor issue I had was with the sound quality. Sitting in the dress circle I experienced some distortion from the speakers, and this interference meant I couldn’t always hear the lyrics. However this disruption was brief, and the songs themselves had so much energy about them I was glad the volume was set to party-levels. Day by Day stood out as a particularly moving track, and I’ve been listening to it on YouTube ever since. The musical culminated in the crucifixion scene, which was carried out beautifully and elegantly, with the blood of Christ represented by red ribbons. I heard a lot of sniffing in the audience at this point, which I think was testament to the cast, musicians, and stage crew who delivered an absolutely amazing show. The only problem I have with Godspell is that I can’t go see it again! Booking Information: This was a one night only charity gala performance.